1. I made a quiche. 2. I had my photograph taken for the local paper. 3. I realised that I am much prouder than I thought. Six months ago, we moved house. We’re loving it. It’s the first house we’ve ever owned and it’s wonderful. Both children have their own room, the kitchen is pocket sized but beautiful, and there’s a garden big enough for Wes to build a workshop in. We finally have space to breathe. All told, we’re very happy. Depression aside, obviously. The icing on the cake for me is the local facilities. A school, nursery and childrens centre in the next road. A thriving community centre. Allotments. Local toddler groups, every day of the week. Several parks. Wide roads. Lots of trees. Health visitors, speech therapists, educational psychologists, playworkers – everyone you could possibly need. On tap. Projects everywhere for the children to get involved in. All of which are invaluable when Wes goes away. As my wise mother pointed out, when all those services are clustered together so closely, there’s usually a reason. And there is. When we were moving, our only concern was the area. It’s not had the best reputation. Our house is ex-council, and there are tower blocks, dispersal orders and a few intimidating dogs. More than one person raised their eyebrows when we told them our choice. On moving day, I asked Wes whether we had just condemned our children to a life of drugs and crime. Thankfully we have friends in the know – and a policeman assured us that most of the reputation was old news. I don’t mind the idea of a dodgy neighbourhood. Admittedly, I mind it more now that there are children to think of. But I like to think they’ll become more rounded, less judgmental individuals if they grow up with all sorts. I moved in with high hopes for the positive influence I would be able to have on the area. The great witness I would be. The people I would befriend and the lives I would change. And then I got depressed. And I discovered that actually, the community I barely knew would befriend me and change me. The elderly neighbour would remind me when it was bin day, and look after my tomato plants when we went on holiday. New friends would lend us camping equipment, and drop round unannounced with bags of clothes for Joel. Mums would invite me round for play dates, talk to me about meaningful things, and compare blogs. I thought that I was moving in to save the area when really, the area is saving me. I’m so grateful. But it’s a huge knock to my pride. I’m very British – I don’t like asking for help. And I certainly don’t like people assuming that I need it. Which brings me back to this morning, and the quiche and the photographer. We’re part of a Food4Families project at the childrens centre. 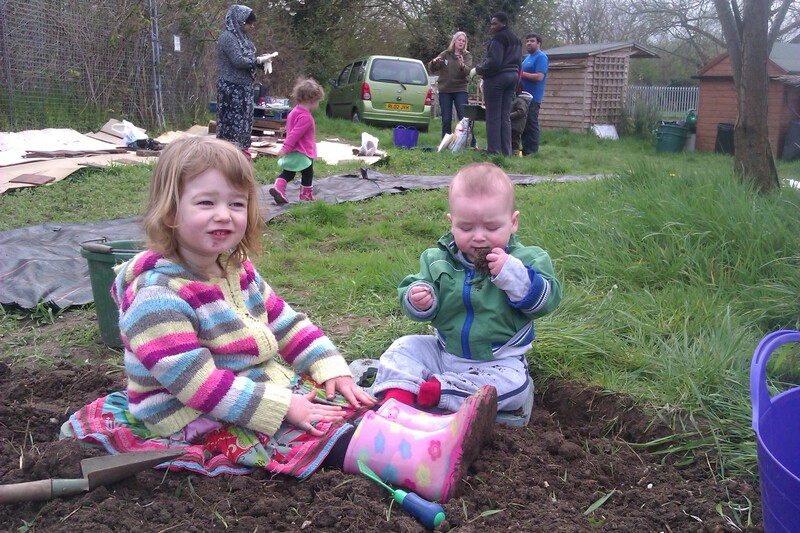 Learning to grow fruit and vegetables at the allotment, and now learning what to cook with them. Hence the carrot and courgette quiche. I was fully on board with the allotment part – I have a huge desire to grow things, and no idea how to do it. I’m learning a lot. And the children love it. The only problem was that I felt guilty all the time. Guilty for using their funding when I wasn’t somebody that needed help. It took me several weeks to notice that I was exactly their target market. Unemployed, no idea about gardening and no money. That was a knock. I’ve been part of these funding programmes so many times – but I’ve always been on the other side. Delivering the project. Changing people’s lives. It’s interesting to see it from the other end. At least, I reasoned, I was learning something new on the allotment. The cooking aspect I was less convinced by. I’m not a bad cook. I certainly watch enough cooking television to be an expert. Part of me went into this morning’s session thinking I would end up helping the tutor. That I was turning up to make sure they met their quota. Doing them a favour. After all, nobody need ever know. And then the photographer turned up. My heart sank a little bit. Everyone who saw the paper would know. Know that I was ‘one of those people’. The kind who need help, rather than give it. The one on the end of the funding. I’m prouder than I thought. The last six months have taught me a lot. People are a lot less different than you think. No matter where you live, everyone is trying to look after their families. Most people are nicer than you expect them to be. Everyone wants someone to talk to. Most people are kind. Everyone needs help sometimes. Even me. I’m growing. And I think I’m even smiling in the photograph.